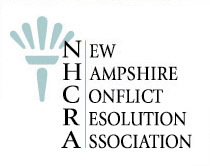 NHCRA is the hub of all the information and resources anyone might need, who is considering utilizing mediation or another cooperative process to work toward a resolution to their conflict. Our constituency is not only our membership, but the more than 1.3 million New Hampshire residents who might benefit from mediation or other alternative dispute resolution (ADR) processes. Whether you are seeking a certified family mediator in your area, a settlement-friendly attorney, a family counselor, an expert on division of retirement accounts, a certified divorce financial analyst, a business valuation company or any other professional expertise that may help resolve the issues you are facing, NHCRA is here to assist you. Conflict is a normal, temporary and sometimes necessary part of life. Although not always welcome, if managed properly, conflict can eventually result in positive change for the parties involved. One of the key factors in determining whether a conflict will ultimately be constructive or destructive, is the method by which it is resolved. Many traditional methods for resolving conflict can be more damaging to the relationship of the parties, than the actual dispute. While adversarial processes like litigation have their place in conflict resolution, at NHCRA, we believe that those cases are the exception rather than the rule. We think the majority of conflicts can be resolved successfully through a more cooperative and peaceable process, such as mediation. Also, these more collaborative methods often preserve resources and relationships, while resulting in longer lasting agreements, developed by the parties themselves.